There are eleven rooms in my house. Over the years my studio at one time or another has been in 4 of these rooms. I started in the basement and 20 years later, I am back in the basement. I have a space for all my art gear and projects in progress. And art is messy! 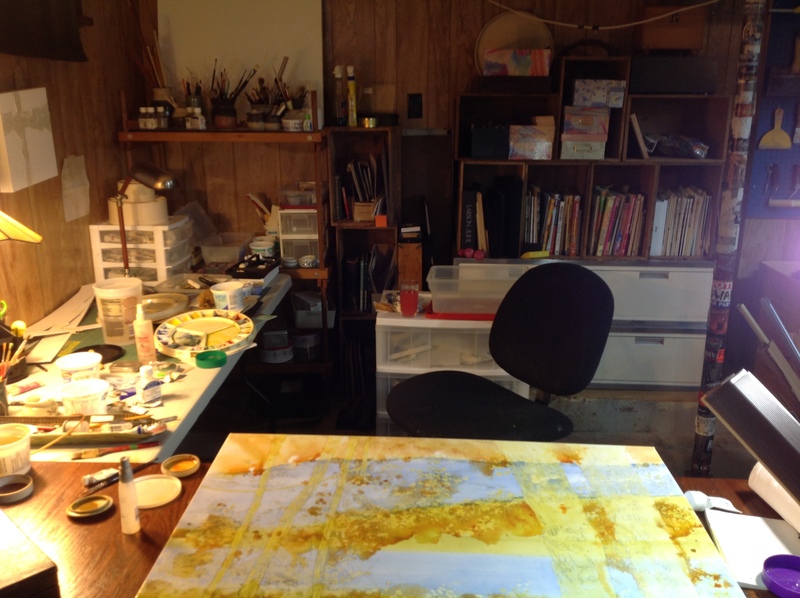 My studio is a working studio, it is not pretty, and there is never enough enough flat spaces for work that needs to sit and cure. 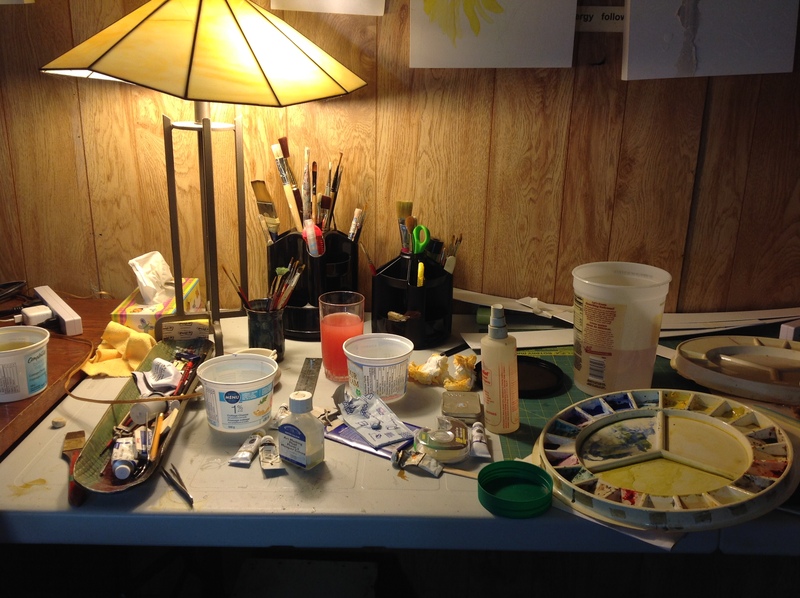 In the basement I can leave work, leave the mess, walk away and everything will be fine when I come back to the studio. 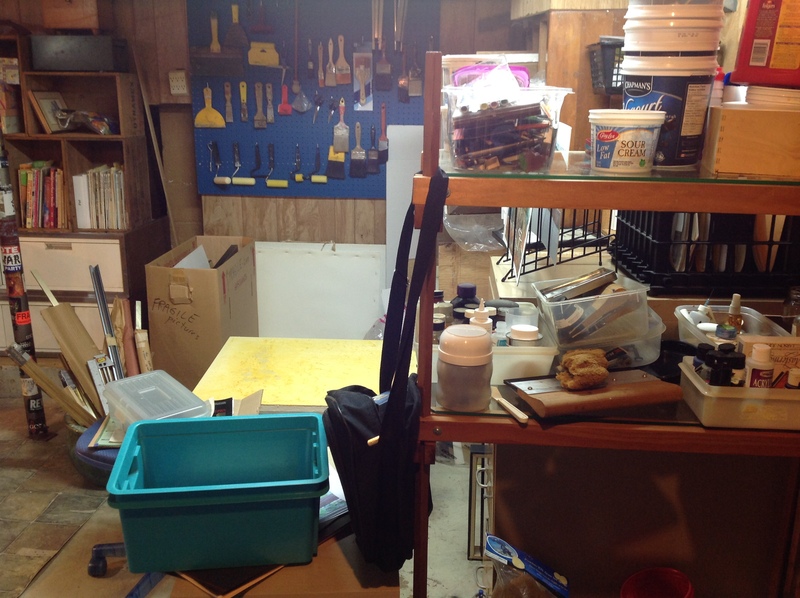 The only thing, I cannot do in the basement is spray varnish because of lack of ventilation. The stacking files behind the chair hides a chimney space where there used to be a wood stove. The blue pegboard is so handy for organizing my larger tools of the trade. 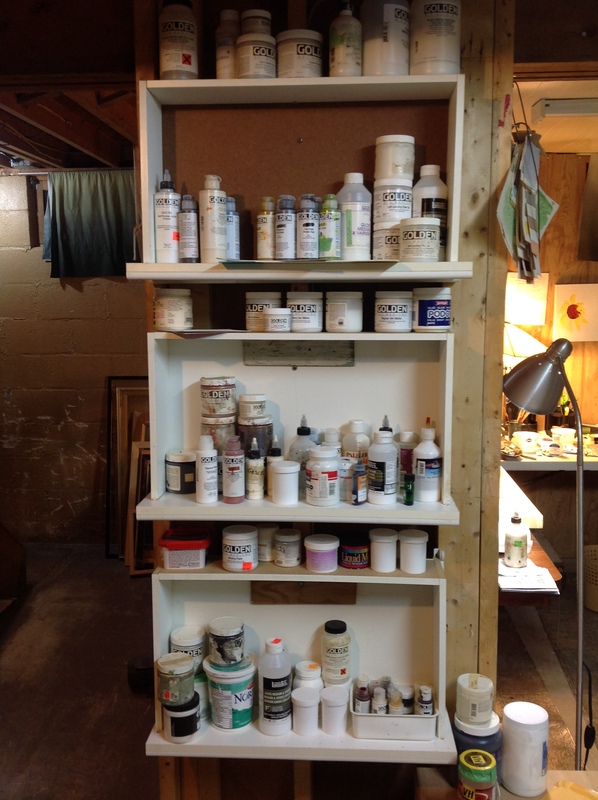 I made some shelves for my acrylic paints and mediums by using drawers from an old dresser. 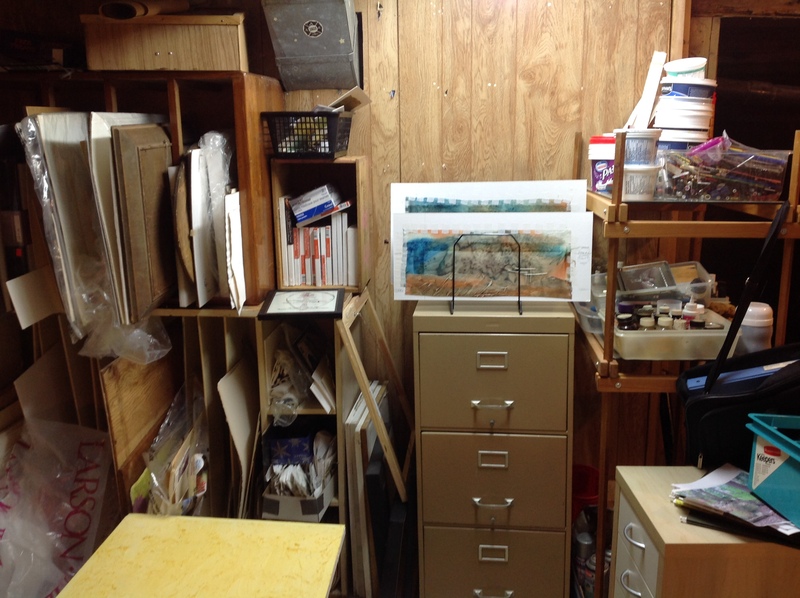 The stacking unit for my watercolour paper on the left top is the rest of the dresser turned on its side. 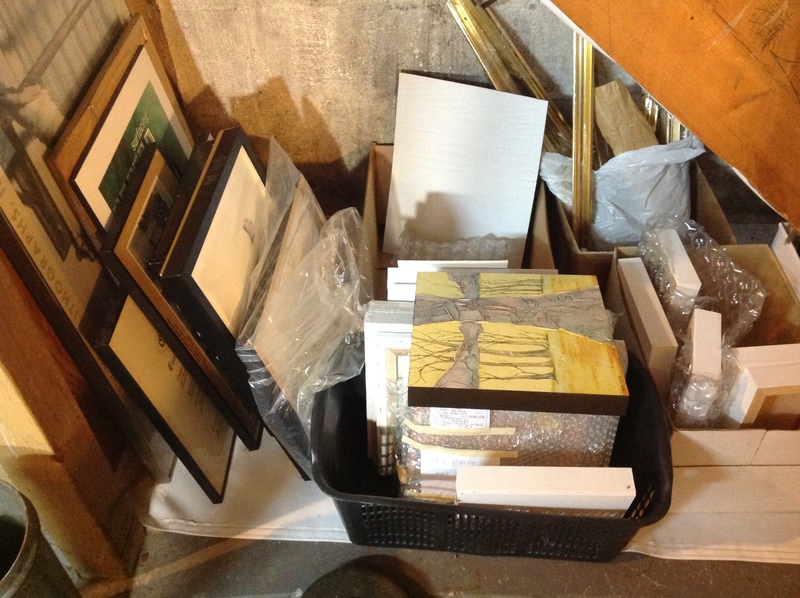 Underneath the stairs also becomes storage space. I did staple thick plastic under the stair runners to keep dust and dirt from falling through the stairs onto my supplies. So that is my space. Works for me! P.S. There are spiders in the studio. happy birthday Heather from your very old friend Barbara Young. Can you believe we are this old?